I just asked the question on my Facebook Teaching Heart Page, “How many days left till the end of year?” The responses came in quick… Teachers are counting!!! I know I am! Love me some summer with the kiddos and no early am’s!!! Let’s make sure you have some end of the year goodies in your pockets. Have you seen the candy bar awards posted on the End of the Year Theme page??? Pick a few that would be good to give to your students. 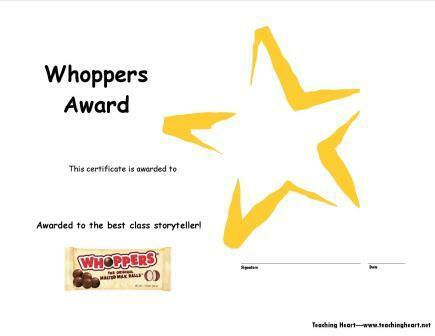 Then attach the candy bar to the award and hand them to your student. We have created a 16 page Publisher File. Each page contains one candy bar award. You can modify the awards to meet your needs. To download the file and print your awards click here. You may wish to print more than one of each award. That is just one of the many goodies posted on the page. Click here to see more End of the Year Ideas!!! How about trying one of these fun units to end the year with? Each has lots of ideas if you click and read!!! Moo… It’s Monday!!! Swith that candy with the Witch!!! Teaching Heart Hands Out Awards – DID YOU WIN?? ?